Let's talk about the Riddick series. Even going back to the original Pitck Black (2000) they were never really very good movies, but they had a certain appeal because of their style and somewhat unique universe. To me they always felt like they had been adaptations of some graphic novel I'd never heard of. As such they acquired something of cult following (which I counted myself a part of), and what was at best a mediocre but original science fiction film became a franchise. 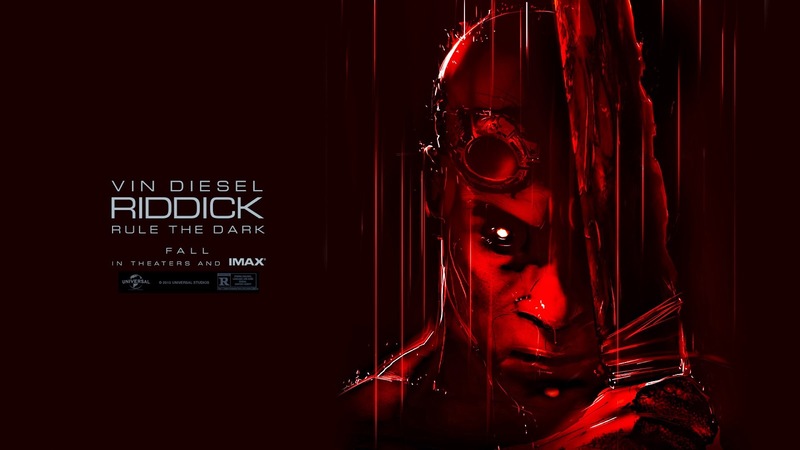 So lead by the series' director David Twohy and its lead actor Vin Diesel, this September saw the release of a third feature length film simply titled Riddick, and as a fan of the series I think maybe it's time Riddick was finally crossed off the list and left for dead. This installment opens with Riddick (Vin Diesel) abandoned on an alien planet where he must fight to survive, which is immediately strange because the previous movie left off with him in the position of Lord Marshal of the Necromongers. Eventually we get a flashback showing how the Necromongers betrayed him and dropped him on this desolate and dangerous planet when he had wanted to finally visit his home world of Furya. 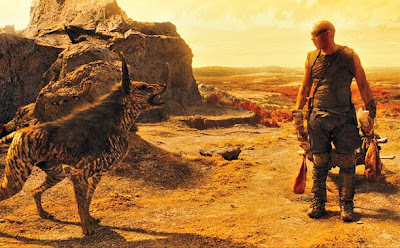 After mastering the indigenous monsters and taming a dog-like companion, Riddick finds a mercenary base and activates its beacon which summons mercs to the planet. 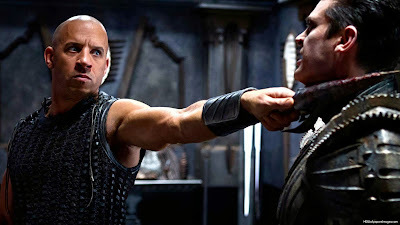 Two ships arrive which compete with each other for the bounty on Riddick's head, but there are more pressing matters for Riddick. A storm's coming, and he needs to get off the planet. Get ready for not much of this. David Twohy's story choices for this film are a little baffling for me. What we have here basically amounts to a bad remake of the original Pitch Black: some bounty hunters are trying to capture Riddick on a planet infested with a dangerous alien species. The obvious move after The Chronicles of Riddick (2004) was to have Riddick finally visit Furya, and Twohy seems to know this because of the flashback he includes, but instead we get this stale rehash of the first movie. The irony here is palpable: in a series with enough creative little details to make original screenplays feel like adaptations of larger universes, with a director who says in his commentary he wants to take the Riddick series in new directions, we wait nine years for more of the same. To be fair, Riddick is different from the previous entries in the franchise in a few ways, but they're all bad. Remember how badass Riddick is in the previous movies? Well in this one you get to watch him mope around and be vulnerable for the first 30 minutes. Remember all of Riddick's great dialogue which is both funny and intimidating? Largely missing. Did you like the Necromongers? They get a 5 minute flashback and are never seen again. Did you love the rich and detailed universe Riddick belonged to? Here we get the father of a character from the first movie and nothing else. Signature minimal color palette remains. In other ways the film remains true to its ancestors, but again it ditches the good to keep the bad. These movies, for whatever reason, have always had a troubled relationship with gender. In Pitch Black we get Jack/Jackie, the girl passing as a boy who becomes problematic when her period begins and endangers the group of survivors. In Chronicles we get Dame Vaako, the woman with no name but her husband's and no purpose but to please him. But these movies worked because they felt like your 10-year-old cousin playing with misogyny because he didn't know any better and was trying to figure out the world around him. With Riddick we get the self-proclaimed lesbian Dahl and an incessant stream of jokes made at the expense of her sexuality, and what previously came off as playful curiosity now feels like your 80-year-old grandpa making racial slurs to get attention. This movie wasn't a total disaster. I still enjoy Riddick's minimal color palette, there were a couple of fun action sequences, and the CGI dog thing wasn't nearly as much of a disaster as I expected it to be. The problem is that these aren't nearly enough to combat the flat story and attract new audiences, and there's not enough fan service to retain previous audiences. I definitely don't think the Riddick universe has reached its full potential, but if this is the best the creators have to offer then maybe it's finally time to call lights out. I understand why you're upset (and I felt like falling asleep a few times while watching this movie), but I think this trash needs to be accepted as trash because it's obvious it will never move on and get better. I just accepted how bad it was and compared it to the first movie (which I didn't really like). Your criticisms are amusing, especially about the Dahl character. Now that I think about it, Riddick tormenting this lesbian seems strange to me too. Yeah Dan I totally know what you mean. I feel like I did that for the first movies: they were bad but they were also fun so I just sat back and enjoyed them. I felt unable to do it with this one because instead of being fun-bad it just felt bad-bad. It's possible I expected too much as a fan of the previous movies though.